Denyse Beaudet’s research demonstrates that those who receive guidance through their dream-lives learn how to face their fears, with the added bonus of enriched creativity through the practice. Many adults understand the importance of their dreams. They diligently record their dreams and analyze the symbols. Some even consciously practice skills, rehearse conversations, or use dreams to release traumatic events from their past. Yet when it comes to children, we seem to forget the importance of these occurrences. We push their dreams off as make-believe and fantasy as if imagination and exploration are childish. We even say “it’s only a dream”. Dreamguider looks specifically at dreams and dreaming in children. The book contains a wonderful section on the evolution of dreams as children grow up which also looks at how children view dreams, what they think dreams are made of, and where they think dreams come from. Most importantly perhaps, this resource also tells us as parents and caregivers how to validate children when they share dreams and encourage them to enjoy these experiences fully. Being the first of its kind, Dreamguider . . . is essential for any family that wants to cultivate and encourage their children to develop a relationship with their dreams in a fun and creative way . . . Filled with real-life experiences, examples and anecdotes, Dreamguider provides a necessary tool for working with your child’s dreams, cultivating in them a deep interest in a lifelong practice of working with dreams through their formative years into adulthood . . . Whether or not we have children of our own, we can all be Dreamguiders. This allows us to focus on a very important and often misunderstood opportunity to understand our children’s development, so that we may in turn support them in their own becoming. Thank you for the very interesting and worthwhile read, Dreamguider. Thank you. It is one that I’ve highlighted, dogeared, and will remain on the shelf as a reference. It presents an approach I never would have thought of on my own. Dreamguider is truly a gift to all parents who wish to establish an open, life- long and meaningful communication with their child. In easy to understand language, Dr. Beaudet offers parents a framework for valuing their child's night life and the insights their dreams may give to daytime concerns. Through her sensitivity to and respect for children, she encourages us as parents to listen without judgment to the dreams of our children. Her practical and beautifully expressed ideas make you feel that you are yourself being guided by a warm, wise and good friend as you seek to understand and validate the significance of the dream life of your child. BEAUDET, Denyse. 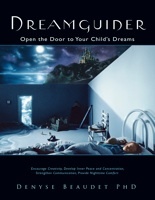 Dreamguider, Open the Door to your Child’s Dreams, Hampton Roads Publishing, 2008, 181 p.
The book is about the dream world of the child. Parents, it is for you. Its purpose is to enable you to accompany your child through his or her dreams. Denyse Beaudet’s approach, respectful of the dream contents that reveal the child’s inner life, encourages creativity and self-esteem. She tackles subjects that are rarely treated such as typical contents found in the dreams of children and their beliefs about the world from which their dreams come. Her orientation is mainly practical: to keep a dream diary, to prepare one’s child for the night, to help him or her when nightmares occur, to follow the process of maturation of one’s child through a dream series. Numerous examples show how the sharing of dreams strengthens the trust and the bond between parent and child. The author does not give recipes, but describes an attitude of acceptance toward dreams. I am sure that such an open-mindedness will benefit other areas in the daily education of a child. She emphasizes that the dream springs from the deep waters of the psyche and brings up the renewal of life, not only for the child but also for the parent. Denyse Beaudet has a Ph.D. in Child Development. Her reflection relies on an extensive knowledge of child psychology and on an understanding of the creative power of the psyche. The book is fluid and alive and it is easy to see oneself, either as parent or as a grown-up child, described in her writing. Beaudet encourages the parent to look with wonderment at one’s child dreams and at the treasures they hold. I wished I had read such a book much earlier in my life as a parent. This book treats of a subject too rarely talked about in education. It stimulates and invigorates the reader. It is a basic book and, as such, I wish it a long life. Denyse Beaudet's Dreamguider: Open the Door to Your Child's Dreams is a beautiful book, both in its composition and design and in its content. The author uses language so beautifully that the reading is effortless. She presents sometimes complex concepts in easy to grasp sentences. The chapters are short, in keeping with thoughts about how to relate to children. Beaudet helps the reader to understand how important children's dreams are. She gives clear guidelines to parents as to how they can guide their children as they become proficient in their dreaming and their living. And she shows understanding and caring about the parents, too, telling them how they can benefit from their children's dreams. This book is practical and direct, and yet lyrical. I highly recommend it to parents, especially when they have children under 12. What I liked best about this book were the magical voices of children, quoted throughout, telling their dreams and what they think and feel about them. Even very small children can tells us that dreams are made of sugar or paper, of rainbow or voice or glue. In Dreamguider, the author, Denyse Beaudet appears as a specialist in child development, particularly children’s dreams, but she is there also as a wise and caring mother and as a friend to us parents, her readers, who want to know more about this rarely treated subject. Beaudet’s various roles as author make her book comprehensive, knowledgeable, practical and insightful. She draws the curtain open to a stage where her young dreamers reveal their thoughts, feelings, creativity and their developing characters. I recommend this book especially for parents who want to form a respectful and deep relationship with their growing children as supportive listeners, chief allies and guides. I might add that, as a parent myself to middle-aged children with children of their own from ages 4 to 22, I have found surprising new ways with Dreamguider and its insights to connect with various generations and to open many fascinating conversations on our dreams.